We've all had that particularly annoying pimple that we wish we could quickly zap away. In a way, you can with an acne spot treatment. Acne spot treatments are over-the-counter acne products that are used to help heal specific, individual pimples. Unlike other types of acne products, they are dabbed only on existing blemishes rather than used over the entire face. Some spot treatments are left on overnight; others dry clear so you can wear them out during the day. You can even find tinted spot treatments that help camouflage breakouts while you use it. Spot treatments work by delivering acne-fighting ingredients directly to the offending blemish. Spot treatments can help reduce redness, swelling, and pain. They can also help loosen or dissolve the blockage within the pore that created the blemish in the first place. Spot treatments only work for minor, surface level papules and pustules. They won't treat deeper, more severe blemishes like acne nodules or acne cysts. These blemishes form much deeper within the skin, where the spot treatments can't reach. Spot treatments are most helpful if you only succumb to the occasional zit here and there. If you battle more frequent breakouts or break out regularly, spot treatments aren’t going to be quite as beneficial. There are many spot treatments available, from bargain drugstore finds to expensive chic brands. It really doesn’t matter which you choose, as long as it contains a proven acne-fighting active ingredient. Benzoyl peroxide: It’s the most effective OTC acne treatment around. Benzoyl peroxide helps reduce inflammation and makes the pore an inhospitable place for acne-causing bacteria to hide. It can be drying, though, so only use it once or twice daily, max. Benzoyl peroxide can bleach out fabrics, so take care around your towels, sheets, and clothing. FYI, don't apply a benzoyl peroxide spot treatment over (or under) Retin-A (tretinoin). Tretinoin breaks down chemically when applied with benzoyl peroxide, so it won't be as effective. Salicylic acid: Salicylic acid is a beta hydroxy acid. It helps clear out the gunk that’s trapped in the pores. It also works well to dry up pustules (pimples with white heads). Sulfur: Sulfur is another ingredient that dries out pimples and helps reduce inflammation. Like benzoyl peroxide, sulfur can be drying to the skin. Differin: Differin, the brand name for the medication adapalene, is the only topical retinoid acne treatment available over the counter (OK, so technically Differin is a retinoid-like compound, but it works in the same way.) In fact, this medication used to be prescription only. It helps exfoliate and clear out the pores. Generally, you'll dab a small amount of spot treatment directly on the pimple once or twice daily. No need to rinse off, let the medication set at least a few hours in order to penetrate the pore. Some products dry clear so you can wear them out. Others are colored, so you'll want to apply them at night only and wash them off come morning. Whichever product you choose, make sure to read and follow the usage directions on your specific product. If you're currently using a prescription acne medication, make sure you ask your dermatologist before you add a spot treatment to the mix. Spot treatments can be a helpful addition to your acne treatment routine. But you may be using them incorrectly and not even know it. Using them too often: Nearly all of us are guilty of this one. Because we want that pimple to go away super fast, we douse it with spot treatment at every opportunity. Using any spot treatment product too often (and if you’re using it more than twice a day, you’re using it too often) will dry out the skin and can cause irritation. And the only thing worse than a pimple is a painfully dry, red, flaking pimple. 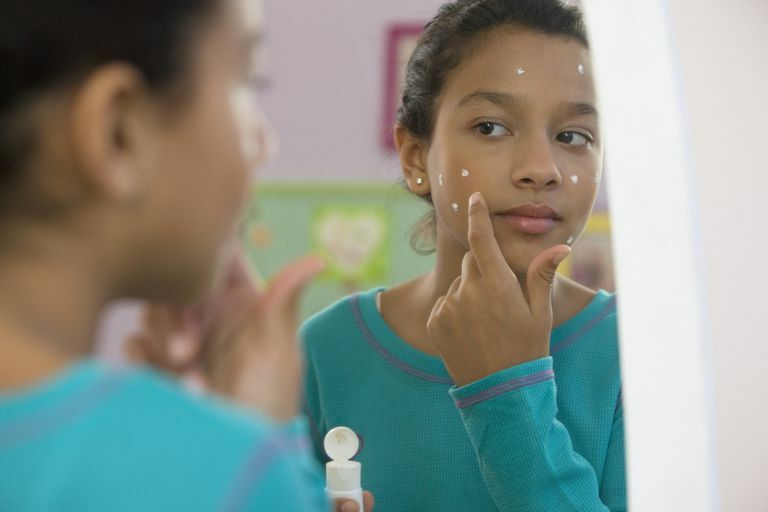 Using "spot treatments" not meant for the skin: You've probably heard of some oddball pimple cures—Windex, toothpaste, garlic. If any of those weird treatments really worked all that well, everyone would be using them. Truth is, these types of remedies don’t work, and they could really irritate your skin. Using spot treatments rather than a regular acne treatment medication: Spot treatments won't clear up your skin. They only work on individual pimples that have already formed and are already visible. With spot treatments you're always behind the eight ball, treating pimples as they appear. In order to have consistently clear skin, you have to stop pimples from forming in the first place. This takes a different type of acne treatment routine. So, while spot treatments have their place, they shouldn't be used as your sole acne treatment product. While there are ways to make pimples heal faster, to get consistently clear skin you need to stop breakouts before they even start. This requires daily use of an acne treatment medication, even in areas that are clear, to keep them clear. If your acne is mild, an over-the-counter acne product might be enough. If your regular acne treatments aren’t doing enough to keep you breakout-free, it’s time to up the ante. Consider a prescription medication, like BenzaClin, Retin-A, or isotretinoin. Prescription medications are a necessity for severe acne. Already using a prescription treatment? Let your dermatologist know you’re not happy with the results. You may need to switch to a different medication. The goal is to get your acne cleared to the point that you’re not having to worry about using a spot treatment at all. If you have a big pimple that won't go away, ditch the spot treatments and give your doctor a call. Your blemish may need a more powerful treatment than an OTC product can offer. Or, it may not be a pimple but rather a boil or another skin problem. When in doubt, call your physician. Rosamilia LL. "Over-the-Counter Treatments for Acne and Rosacea." Seminars in Cutaneous Medicine and Surgery. 2016 Jun;35(2):87-95.